Yep, I wrote about it before. It was an imitation of China’s Forbidden City, and it is the miniature imperial city where the royal blooded lives during their time. Exclusively just for them, no one was allowed to enter the city but them. Although, it is now open for public at present. 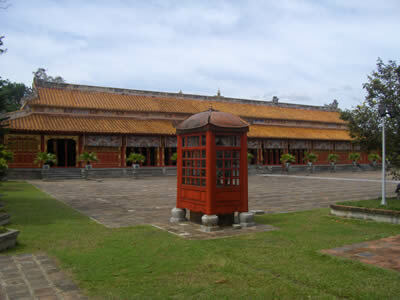 Majestic Old Imperial City in the middle of Hue’s city. Entrance Fee: 50,000 VND. There’s also a theater inside the Forbidden Purple City where you can enjoy traditional performances with separate fees, as well as using the costumes and props for picture taking. Be sure to allow 4 hours of time to see all that is to see in the Imperial City.